What an amazing night celebrating Dana Andrews and LAURA (1944) at the Egyptian Theatre! Carl Rollyson was at the Egyptian to sign his excellent biography HOLLYWOOD ENIGMA: DANA ANDREWS. I strongly encourage any Andrews fans to pick up this book, which was written with the cooperation of the Andrews family and is filled with primary source research. 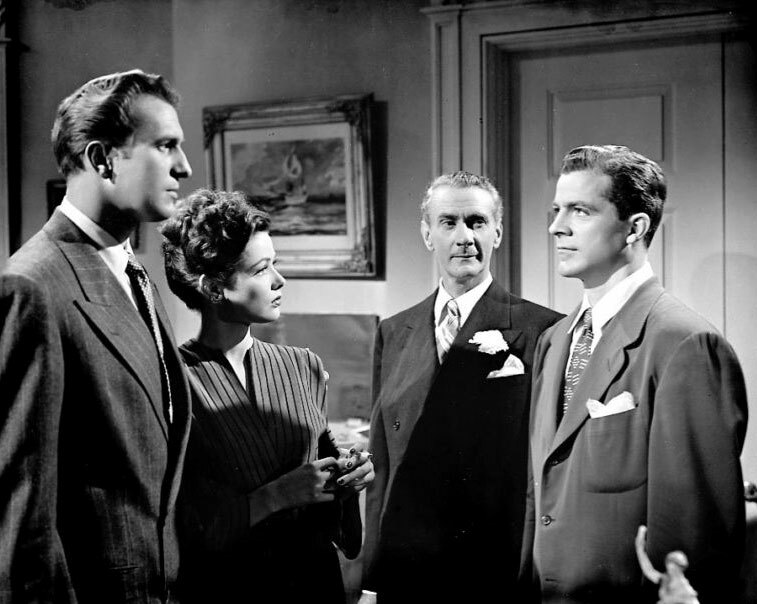 I was very happy to meet Carl after getting to know him a bit via Twitter and his occasional comments at my blog, such as when I wrote about WING AND A PRAYER (1944) during last summer's Dana Andrews Blogathon. Also on hand tonight were the Film Noir Foundation's Alan K. Rode and fellow classic film bloggers Deb of Sidewalk Crossings and Lindsay of Lindsay's Movie Musings. We were all fortunate to have the chance to enjoy a lengthy chat not only with Carl, but with Dana Andrews' daughter Susan, a lovely lady who was happy to share her memories -- including having been babysat by Walter Matthau when he toured with her dad in a stage production of THE GLASS MENAGERIE! It was a special opportunity to be able to express appreciation to Susan for her father's work, as he's been one of my favorite actors for so many years, and she very kindly joined Carl in signing his book on her dad. Among other things, I enjoyed hearing that she's also a fan of DEEP WATERS (1948), one of her dad's films which I recently saw for the first time. Before the screening Alan, Susan, and Carl each took a turn sharing some thoughts on Dana Andrews and LAURA. Susan shared how Carl's research and command of facts regarding her father's life had enabled her to put things she knew about her dad into a larger context -- including why he was able to treat her childhood bee sting so effectively! (It turns out one of his many jobs prior to coming to Hollywood was assisting a beekeeper.) I particularly enjoyed Carl's insights on Dana having gone to a personal "film school" while working as a projectionist in a rural movie house. He also pointed out that vestiges of the original concept of LAURA's tough Mark MacPherson as a more sophisticated character show through in certain bits of dialogue. The last time I saw LAURA on a big screen was at the Sherman Theatre as a teenager in the '70s. Needless to say, it was a real treat to see this favorite film on a big screen again. The quality of the Egyptian's digital presentation was excellent. I marveled at how the many small nuances in the characters' expressions are so much easier to see blown up on a giant screen -- this was especially the case with Andrews' subtle performance. The large screen enables the viewer to see the merest start of a smile or a light flashing in his eyes, things that are all too easy to miss on a smaller screen. It also helps being able to focus on a film like LAURA in the dark, completely undistracted. Classic film fans are doubtless familiar with LAURA: Detective Mark McPherson (Andrews) investigates the murder of glamorous advertising executive Laura Hunt (Gene Tierney). 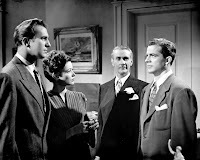 His suspects include snobby columnist Waldo Lydecker (Clifton Webb), who was a mentor to Laura; her feckless fiance Shelby Carpenter (Vincent Price); and Laura's relative Ann (Judith Anderson), who loves Shelby. Or could the killer even have been Laura's seemingly devoted maid, Bessie (Dorothy Adams)? 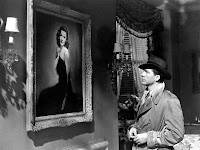 Detective McPherson wanders around Laura's apartment, staring at her portrait and seemingly falling in love with a dead woman...and then, to Mark's disbelief, Laura walks in the door, very much alive. 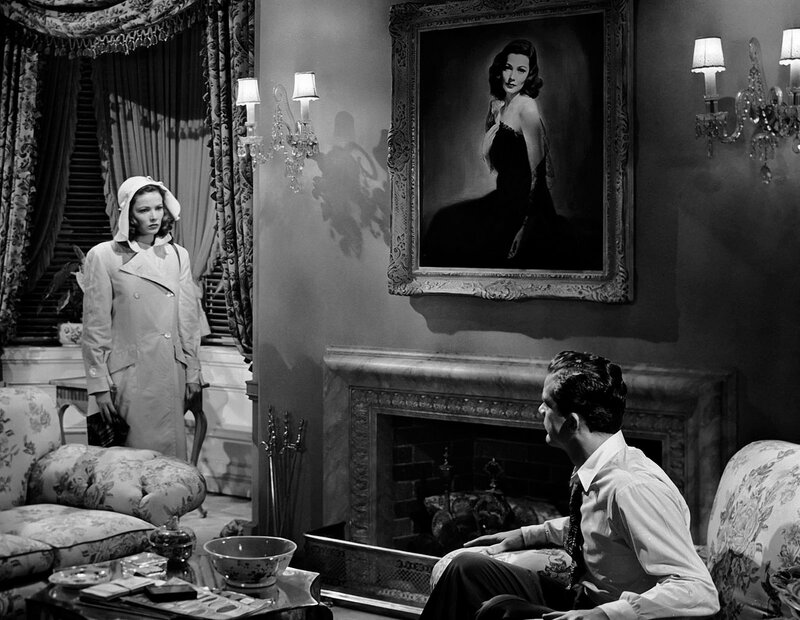 Every bit of this film is perfect: The dialogue, the line deliveries, the gleaming black and white cinematography by Joseph LaShelle, Laura's to-die-for wardrobe by Bonnie Cashin, the direction by Otto Preminger, and David Raksin's haunting score. The film is extremely well paced at 88 minutes. 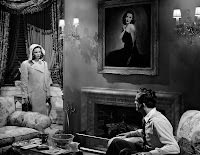 The smart screenplay, based on the novel by Vera Caspary, even makes a wisecrack to defuse something that might otherwise be an issue for the audience: for a supposedly smart girl, Laura sure has managed to surround herself with some dopes! I've enjoyed this film countless times and always pick up on something new, one of the marks of a great film. During this particular viewing I realized that one of my favorite scenes in the entire film is the quiet scene with Tierney and Anderson late in the film. Anderson's matter-of-fact admission of knowing Shelby's flaws and wanting him anyway is mesmerizing -- and when she says she's not the killer, you believe her. Members of the Bess Flowers Fan Club will be amused to note that when Waldo tells Mark that he introduced Laura to everybody important, yes, Laura is shown being introduced to...Bess Flowers! IMDb needs to add this title to the list of credits for the World's Greatest Dress Extra. 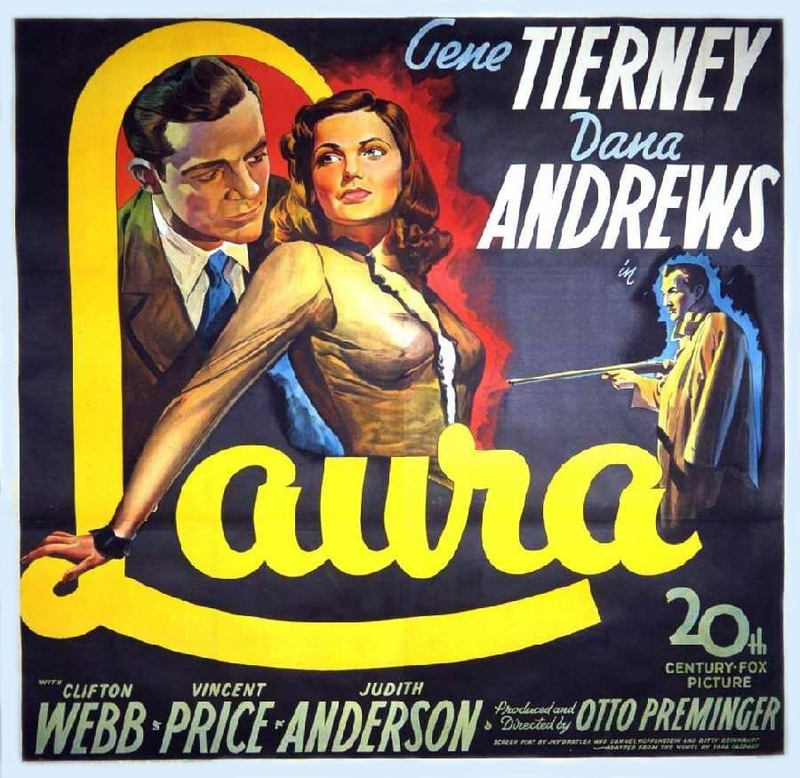 LAURA was one of several films costarring Andrews and Tierney. 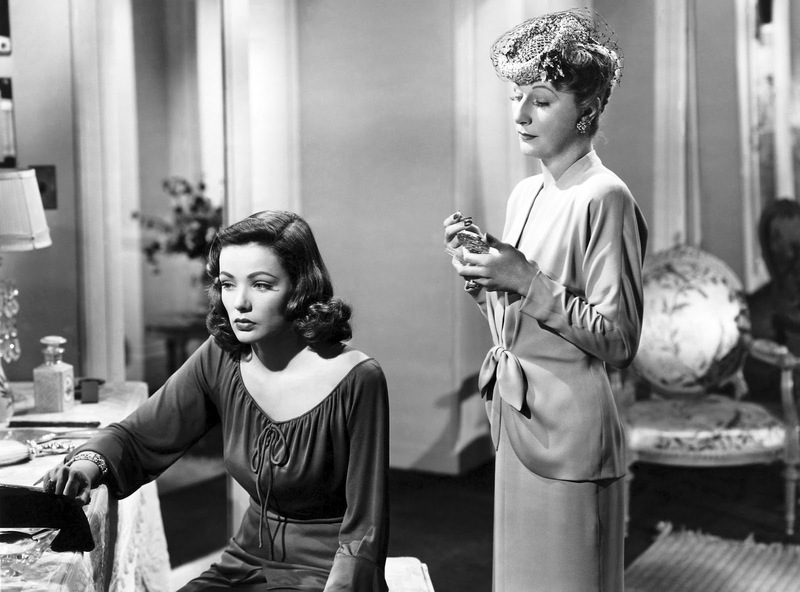 They also appeared together in BELLE STARR (1941), THE IRON CURTAIN (1948), and WHERE THE SIDEWALK ENDS (1950). 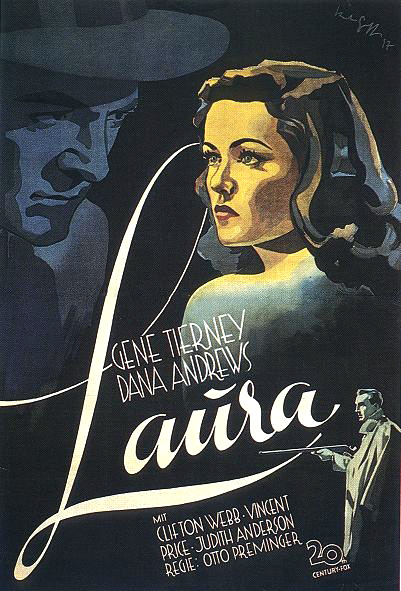 LAURA is available on DVD as No. 1 in the Fox Film Noir series. Extras include two different commentary tracks, one by Rudy Behlmer and the other by Jeanine Basinger and composer David Raksin; it also includes A&E BIOGRAPHY episodes on Gene Tierney and Vincent Price. The DVD can be rented from Netflix or ClassicFlix. 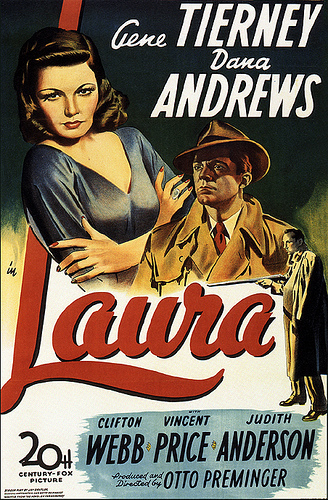 LAURA has also had a release on VHS. Additionally, it's shown from time to time on Fox Movie Channel, where it will next be broadcast on March 3, 2013. For more on Dana Andrews and LAURA, I enjoyed a 2008 essay by Imogen Sara Smith at Bright Lights Film Journal. 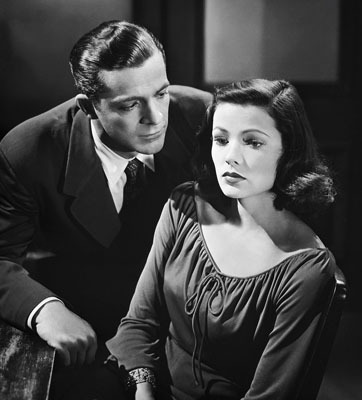 LAURA is a five-star classic which rewards the viewer whether it's the first or the tenth time to see it. Most highly recommended. April 2017 Update: I saw this film in a nitrate print at the 2017 TCM Classic Film Festival. Thanks for sharing this wonderful evening. Love Susan's mention of having Walter Matthau for a babysitter. I'm particularly interested in the stage work of Andrews and other Hollywood stars. I guess I'm a charter member of the Bess Flowers Fan Club. I'd have to be by now. Wow! What a glorious evening. Nothing to beat seeing a film where it should be seen. Can I join the Bess Flowers fan club. I always look out for her. I was very much looking forward to reading this post. Glad to hear the night was a success!